This is a completely customized Detroit Red Wings cake topper ordered by one of our customers. They would like a hockey wedding cake topper, with them posing in a hockey face off, with sticks in hands and puck between sticks. The groom is a Toronto Maple Leafs fan and the bride is a Detroit Red Wings fan. They would like the figurine to be dressed in the uniforms/jersey's of their teams, with their last name (Fitzsimmons) on the back of both of their jersery's. At the very beginning, they wanted to have their baseball teams hats on their heads (Groom is Toronto Blue Jays - bride is Detroit Tigers), but after checking the first 2D sketch, they preferred to remove the hats. For the base, they would like a hockey rink shaped base with half blue and half red nameplate on the front, saying “Rich & Trina April 30, 2010". The interesting part is we got this order at 29 January, 2011, but the date on nameplate is April 30, 2010. The clients explained that they went to city hall on April 30, 2010 and got married with no family present. Now this year (2011) on April 30th they are doing a ceremony & reception...So they would like the year on the nameplate to reflect the original year of 2010, with the date being April 30. 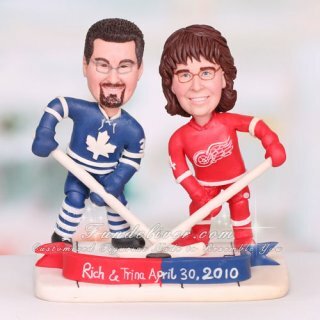 Love this Detroit Red Wings and Toronto Maple Leafs hockey wedding cake topper? 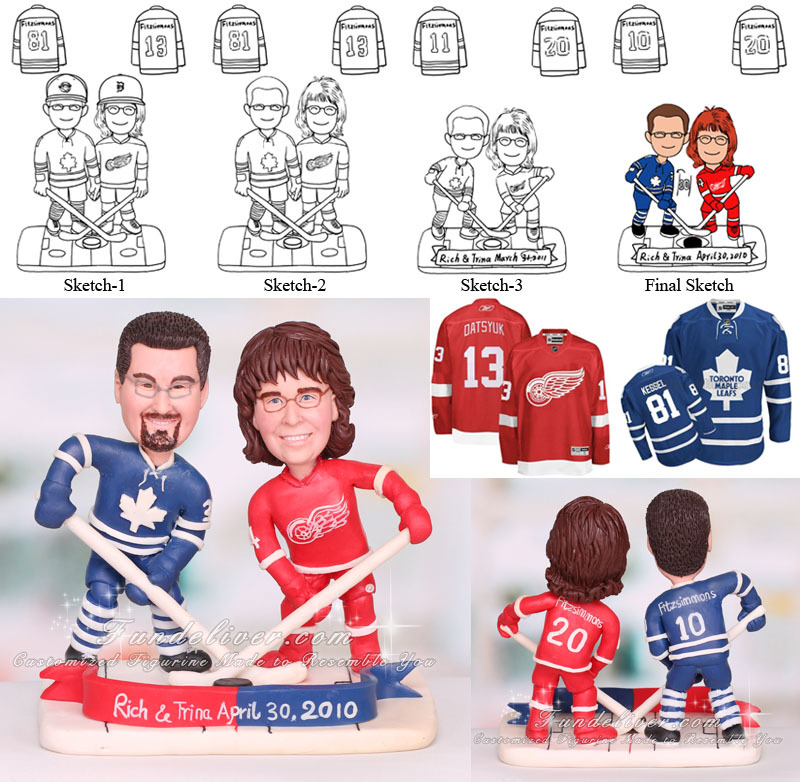 What is your design about your hockey cake topper?